ANCHOR ALARM The Anchor Alarm comes with options for late set - in case you forget to set the alarm when you drop the anchor you can still do it later. You can also manually enter the anchor coordinates, in case you saved them on another device. If you decide to take your device ashore, you can pause the alarm and reactivate it later, when you return. The app has a dedicated map screen, where you can see your surroundings. 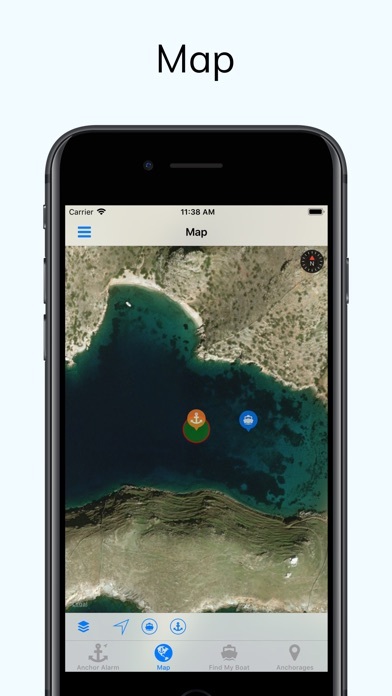 FIND MY BOAT The app can remember the location of your boat when you leave and point you to its location later. In can also point to your last anchor position in case you forgot to set the boat position. 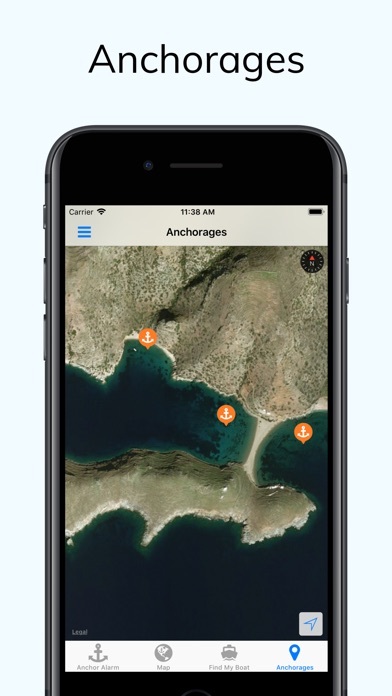 ANCHORAGES MAP The app includes a map of more than 8000 anchorages around the world for free. FULLY CUSTOMIZABLE The application allows you to personalize your experience through customizable settings such as: • measurement units • dark/light color schemes and an automatic color scheme based on the sunrise and sunset times • alarm sounds • GPS accuracy threshold • The time before a bad GPS accuracy alarm is triggered APPLE WATCH APP The app supports Apple Watch. 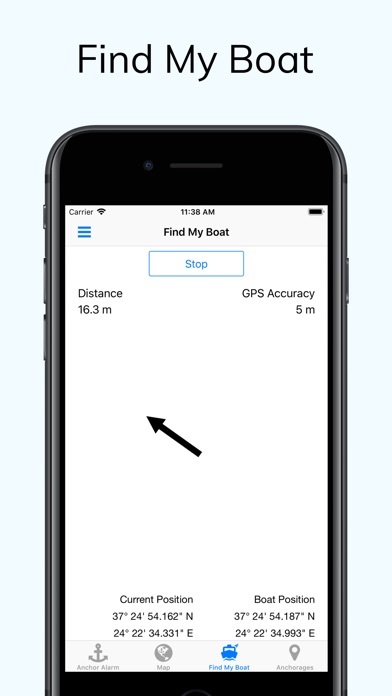 In addition to the distance to the anchor and GPS accuracy, you can monitor the boat speed and heading. Like us on Facebook or join our group to get updates on what's going on with the apps, get help or suggest features. https://www.facebook.com/ancalarm Note: The app may use your device's GPS in order to track your position relative to the anchor. Continued use of GPS running in the background can dramatically decrease battery life. This app is wonderful. What sets it apart from others is your ability to do a “Late Set”, or activate after the anchor has been dropped and the chain/rode let out. Standing on the bow, playing with an app while anchoring is dangerous and easily could lead to losing your device. Not so with this app. 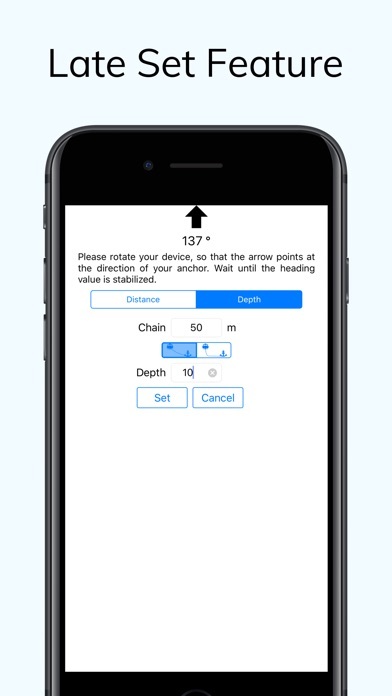 Simply point your device in the direction of the anchor, enter the amount of chain/rode let out, and the depth and you get an accurate display. One word of caution. Distances are calculated to the device. 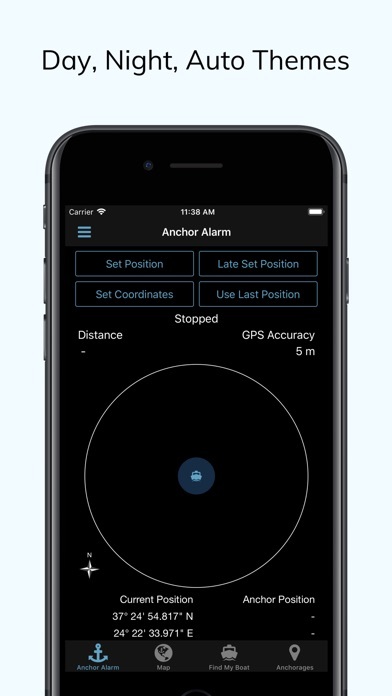 If your iphone or iPad are in the cockpit or cabin, you’ll need to add the distance from the bow to the device to the amount of chain/rode used. Also you’ll want to add that distance to the safety perimeter so that your device remains within the confines of the alarm area. I’ve communicated this to the developer and hope to see this incorporated if a future update. I’d recommend this app to anyone dropping a hook anywhere anytime. Two thumbs up! This app needs a serious upgrade. It does the very basic alarm function “okay” for a bit, but then will reset and erase all the stored graphic data for no apparent reason. This means there is no way to tell where I was or whether I’ve dragged. Using last position button doesn’t bring it to the last anchor set, but to the last boat position. Useless. Right now, the GPS is 5,000 feet. I assume this is because I had the phone in my pocket when I went ashore. There is no way to reset the program. I have opened it. Closed it. Reset the value with settings... no joy. I need a good Anchor alarm and was hoping this could replace Drag Queen. Sadly is needs quite a bit of work. Very intuitive, easy. Seems accurate and no false alarms. Seems like a good concept. Not really intuitive. It would be much better if you could drag the anchor to where it actually is and have the boat swing from there. The way this is set up, you have to have your phone in your hand and set the anchor position when you drop it. I’m more likely to drop the phone since my hands are full. Nice interface, but app fails to acquire anchor position and immediately shifts to alarm mode. Perhaps needs updating to current iOS? UPDATE: Issue appears to be related to using “feet” instead of “meters”. Switched to meters and app works great. Upgraded to four stars. I like the Late Set feature!